Having a secure home is important. For many of you, the front door of your home is the main point of entry. If you don’t feel completely safe with the locks you currently have, you might want to consider having them replaced or at the very least, rekeyed. There are some very compelling reasons why you should seriously consider replacing your locks or having existing locks rekeyed. It might seem like an unwanted chore or unnecessary expense, but replacing your locks or having them rekeyed is a great way to improve security. 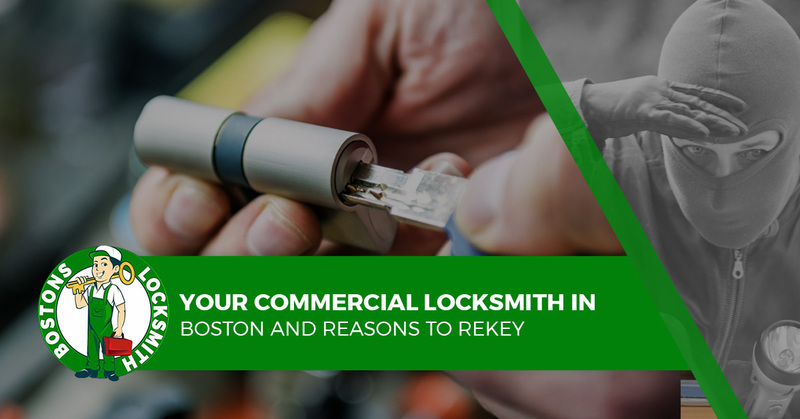 Bostons Locksmith, your commercial locksmith in Boston, offer these important reasons to replace or rekey your home or business. If you have ever lent a key to a neighbor or a friend and never had it returned, you may wish to consider having your locks rekeyed. Even if the person you lent the key to is trustworthy, it never hurts to be on the safe side. You just never know what may have happened to the key. We cannot stress this enough. All too often, people purchase a new home and do not rekey the locks right away. This is one of the first things you need to do after moving in. In addition to not knowing if the previous owner still has a key, there could be neighbors or others that have a key to the house. Not only that, your house key has been basically handled by a number of real estate agents and other people like contractors who may have been doing work, cleaners and others who prepped the house for the sale. Another common reason to have a home rekeyed is in the event of a divorce. Even if the split was amicable, it is still a good idea to have the home rekeyed. It is the best way to protect your possessions. It is also a good idea to rekey your home in the event of a breakup if your ex had a key to your home. Even if the key was returned, there is always the possibility that a spare was made. It is just not worth the worry. It is important to get your locked rekeyed after a roommate moves out. Even if the roommate left on great terms and is completely trusted, they might have lent the key to someone else at some point and you are unaware of it. If you had to fire an employee, it is best if you have the locks on your place of business changed or rekeyed. It is also a good idea to rekey locks after you have experienced quite a few turnovers at the office. Everyone has misplaced a key at some point in their lives, it happens to the best of us. Just one lost key might not seem like a big deal, but it can lead to a break-in or something worse. You will sleep better at night knowing that the lost key was rendered useless when you have the locks rekeyed. If your home or business was broken into, you need to change the locks or have them rekeyed right away. If you find it is getting difficult to lock and unlock your doors, it is probably time to have the locks changed out. Just like all of the other components of your house, locks aren’t built to last forever and will wear out. If you are interested in having your locks changed or rekeyed, call Bostons Locksmith today.